This pretty valentine is a mythical stereotype that contains just about everything, including Rousseau’s sauvage noble. Sadly, the cloak of legend usually obscures the salt of reality. Skimming around the ghosts of those trees nowadays are vultures gorging off a by-gone culture & dreams that never die. Precious little Cacáo Real (Cacáo Royale) still stands, hybridized out of existence what the Spanish hadn’t already exhausted during their conquest, except as maybe ornamental remnants in backyards dotting the region whose homeowners probably sit unaware or have neglected. Criollo in these parts means whatever was on the property when grandpa was still alive (translated: often well after scientists sent the clones in to replace them). Too few, in any ways, to gather into a pile for fermenting a single Cru Bar let alone a whole production run. Yet that’s exactly what Bonnat on this quest has apparently achieved. All the screed would pass for hokum except it provisionally may be true... bloody valentine et. al. Someone is speaking to the trees in the spirit of St. Francis Assisi & they're seemingly answering back kindly. Ecco Xoconusco? Stéphane Bonnat might have found it, an objet trouvé (or at least a damn convincing replica; either that or he’s a master of prestidigitation in the dark arts)... perhaps of the likes seen by Friar Alonso Ponce who journeyed thru Xoconusco in 1586 to record the first known description of its trees... & the dream lives on... forever... which is a long time. 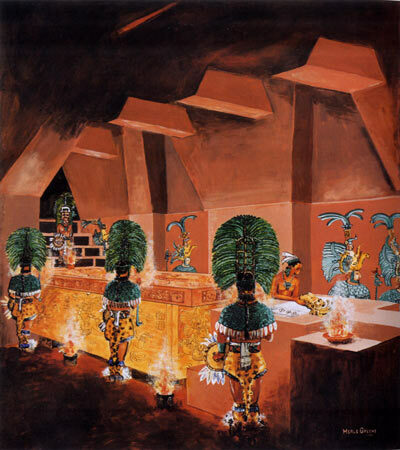 Royal cosmic dreaming inside Merle Green Robert’s imagery of Mayan ajaw's (king’s) tomb. Take extra melatonin tonight with l-theanine on top of the Theobroma in this bar to get the same archetypal buzz as the King. Heirloom in quality if not fact. Cacáo ‘real’ in this instance means ‘royal’ (the Spanish translation) & plain real in English. Such a thoroughbred that discussions of symmetry & balance become moot. Neither sells short nor even flinches. Simple to be sure; & simply beautiful where the full emergence of it produces complexity: sublime defined. Of extremely quiet – even reverentional – intensity that some may criticize as a monochromatic dimension. This, the closest Mexico gets to Porcelana instead of that misnomer from Finca La Joya. 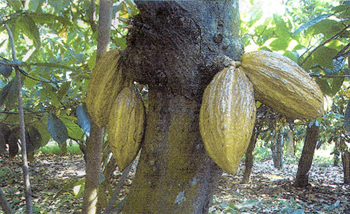 The only real national comparison is Ki’Xocolatl - from a different region. Other Xoconusco releases to date (Askinosie & Chocovic), while intriguing curios, simply fail to compare because those may have greater amplitude on the flavor index (inelegant such as they are) but they pull beans from several farms in the area generating woefully random batches, where this on the surface tastes of estate-grade & perennial consistency, cultivated with some likelihood from special-reserve trees (again, by comparison to other Xoconuscos), well-managed in the post-harvest in any case, deserving an extra bonus point for sourcing & selection. So mild yet present, without the finesse of the finest Venezuelans but more grounded & structured, sound backbone felt in those tannins & unmistakably Mesoamerican with those desert fractions at the end. The caveat with Bonnat, & French chocolate in general, is picked up right in the Aromatics: too much butter that can be suspect to strangulate Taste. This bar’s meekness simply fools of seeming underpowered but at the core lies a mighty nature, begging the obvious: is it of noble heritage or merely a clever cover-up / butter-up? What's really cowering underneath? Bonnat keeps to the house rules of warm roasting, generously soothed in ample butter that at times feels as much a player as the cocoa mass, eliciting those cream tones. Such metrics, however, are proportional & compatible given the particulars. Similar to Coppeneur’s Porcelana Venz, Stéphane Bonnat heats it up just enough to leave a shadow around the corona that reminds of cacáo’s primordial past. Then he treats it to that luscious conche job that goes quite a distance to streamline the contours, avoiding the jiggly / jagged edges in so many Mexican chocolates. Clean too; aside from all the butter, no theatrical make-up (vanilla) or plastic surgery (lecithin); just cacáo spiced with sugar. Credentialed as is, whether a new clone or an ancient heirloom, a trophy chocolate. Only genetic testing, lower-fat formulations, time & future releases will tell if these trees are for 'real'.